Shree Swaminarayan Temple Cardiff and Shree Kutch Leva Patel Samaj Centre held a community fete for Noah’s Ark. Young children from the community organised entertainment, stalls and games. With a bouncy castle, rodeo, face painting, children’s play, henna art and first aid training there was plenty to keep the local residents and community entertained. Traditional street food and drinks from Gujarat in India were served to keep the hot sun at bay and cool everyone down! 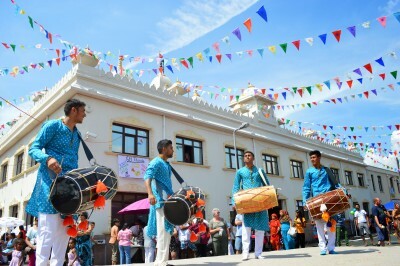 Children performed various live music and dance acts on stage, whilst the local residents of Grangetown took an active part in the entertainment and were given tours of the temple and Samaj centre and history which all found a rewarding experience. Well done on raising a fantastic £2350!